Beyond the obvious benefits of having a beautiful, clean home exterior (like enhanced curb appeal and increased property value), there are additional factors that will matter to many people and their families. Because the accumulation of dirt, dust, algae, mold, and mildew on your home’s exterior not only looks bad, it can also play a role in irritating allergies and other health conditions. Almost everyone know how important it is to keep your Greenville, NC area home’s interior surfaces and carpets as free of dust and dirt as possible. So why shouldn’t the same care be taken for the exterior of your home? Picture this: from the perspective of airborne algae, mold, or mildew spores, your home’s exterior siding presents a virtually unlimited source of surface area to latch onto and spread across. This not only poses a serious aesthetics issue, it can also exacerbate any allergies or respiratory conditions that you or anyone in your family may have. Keeping allergy symptoms under control is hard enough without having to worry about what’s living on your home’s exterior, too. Soft Wash House Washing attacks and kills the unwanted organisms living on your siding! It also washes away the buildup of dirt, grime, and dust that have a negative impact on your home’s appearance. Plus, our “Soft Wash” method is as gentle as it sounds. 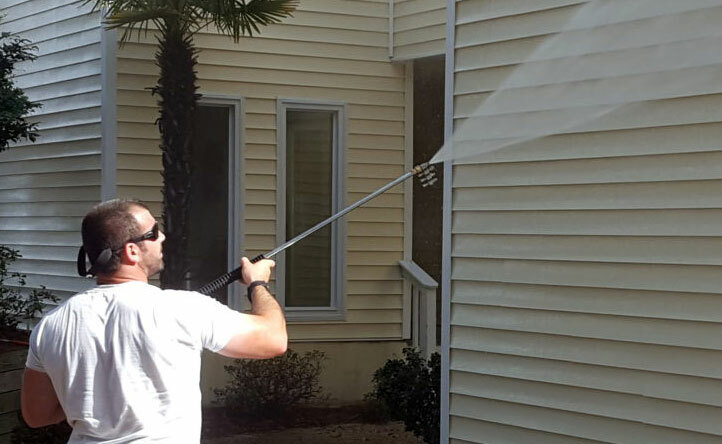 By applying our eco-friendly cleaning agents and rinsing at low pressure, we are able to deliver impeccably clean, long-lasting results, with ZERO RISK of the damage to your siding, soffits, gutters, or downspouts that can occur with standard high pressure washing. Want to know more or schedule a Soft Wash House Washing estimate? Give us a call in the Greenville, NC area at (252) 258-5975. Or CLICK HERE to contact us online.